Why is a raven like a writing-desk? If you can answer that riddle, then you truly are as mad as a hatter. But, everyone is mad in Wonderland, it kind of comes with the territory. In a world where talking rabbits carry pocket watches and grinning cats can disappear at will, going mad is inevitable. It's not all bad though, you get to wear and do whatever you want, and everyone just shrugs it off as "one of your quirks." The next step is obviously to fully embrace your madness, and the best way to pull that off is by dressing the part. Do you know what every hatter needs? A charming disposition! 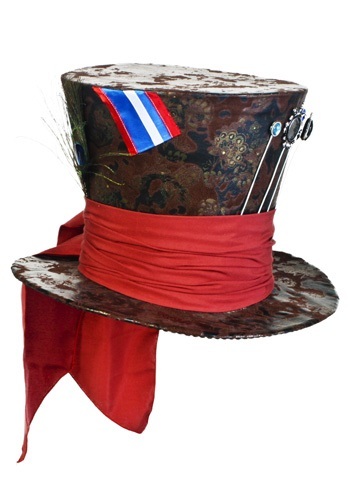 Also, you may want to wear this Jumbo Brown Mad Hatter Hat for good measure. All of the little details, like the decorative hatpins and the peacock feather stuck in the scarf, give this top hat an eccentric vibe, and make it a wonderful accompaniment to your Wonderland costume. It's the best way to look as mad as a hatter, without having to ponder too many riddles.